Majestic Rock Records have done a tremendous service for all Black 'n Blue fans who just couldn't bring themselves to spend up to US$100 for each of the band's four albums on Ebay. The entire back catalogue of Black 'n Blue has been reissued by this UK label, remastered, but without any bonus tracks. However, the sound is great, and the booklets have been spiced up with additional notes as a bit as an extra bonus. Often regarded as a party rock band, the band's self titled debut is very much grounded in a NWOBHM sound. It's heavy enough to appeal to metal fans, yet it is fun enough to please the party rock fans amongst us. With this hard edged sound and their own version of Dee Snider fronting the band (Jamie St. James), success never bestowed itself upon this band. That's too bad, since this debut album knocks the socks off a large portion of the 80's rock music that did make it big. Each of the songs contains hard hitting riffs and flamboyant soloing which was quite commonplace for NWOBHM acts of the early 1980's. When combined with the big chorus lines and slick production, the recipe for success seems to have been in place. There's even a nicely done cover of Sweet's Action on this album. However, this album remains one of the most underrated rock / metal albums of the 1980's in my opinion. In terms of consistency, this debut album is probably the best of the four. Each song is catchy, energetic, and just as good as the others on the disc. The guitar work is certainly at its heaviest on this disc, another positive in my book. Despite the band's glam-o-rific image, this album delivers quite a punch. Those of you who enjoy NWOBHM will appreciate the song structures and musicianship of this album. The cross pollination of NWOBHM with party rock makes this album heavy, and fun to listen to. Through the years, this album still gets regular play in my stereo. 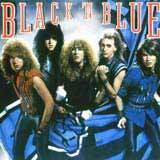 Black 'n Blue would release three more albums before their untimely demise in the late 1980's. Although the band would commercialize their sound to some degree with subsequent releases, the self titled debut is certainly the album most likely to appeal to strictly heavy metal fans.